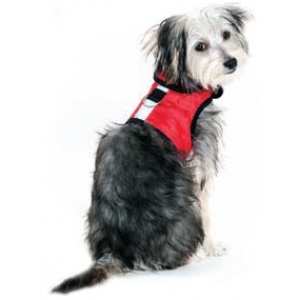 A reflective collar is the first step to keep you and your dog safe, a reflective dog vest is the second. Daylight Savings Time come into place, meaning early evening walks with your dog will be in failing light or mostly in the dark. Your dog will still need his all important exercise, and unless you can take him out earlier during the daylight hours, your walks are going to be presented with extra dangers from passing traffic. From a drivers point of view it is much easier to spot a reflective dog collar or reflective leash, even easier to detect a black dog if it is wearing some kind of reflective dog vest. Fortunately the pet goods manufacturers have recognized the problems presented to dog walkers and cat owners, and produced an assortment of reflective collars and pet safety items to make it safer for you and your pet to walk at night. Most of these items are very inexpensive and could save a life, reflective dog collars, leashes, harness', rainproof reflective dog vests are all available. It is important for your dog's safety and comfort that you make sure that your dogs reflective collar is the correct size, measure for a dog collar by measuring your dog's neck. A simple guide, fit two fingers (flat) easily between the tape and your dog's neck this will give your dog adequate space for it to be comfortable. A collar should be a comfortable fit around your dog's neck and not tight, although it should not be too slack or he may slip his collar or snag on something. If your dog is accustomed to being let off the lead, you might like to consider a longer reflective dog leash that will still give him a sense of freedom but will ensure his safety and the safety of others. Also at this time of year in England there will be those who take great delight in letting off fireworks which will spook your dog and may cause him to bolt, so it is wise to keep him on a leash. Other things to consider when out walking in winter whether during the day or at night is the temperature and the possibility of a sudden change in weather conditions, again it is best to take along an umbrella and dress up warm, carrying a torch by night is always useful. Remember Be Seen, Be Safe. Be Seen, Be Safe is a motto that has been around for many years and I believe that it has probably saved many a life. As a driver it is so much easier for me to spot a dog or cat, and human of course if they are wearing reflective high visibility clothing, reflective collars, leashes and reflective vests will keep you and your pet safe, at very little cost you can secure the safety of your pet. 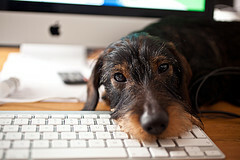 Modern dogs have become so domesticated and accustomed to living along side their owners indoors enjoying all the modern conveniences of central heating, plush carpets and soft beds, they have become so acclimatized to these conditions, so when the temperature falls, they feel cold just as much as we do. Even with their natural fur coat, they will need protection from the extreme temperatures that we seem to be experiencing year after year. 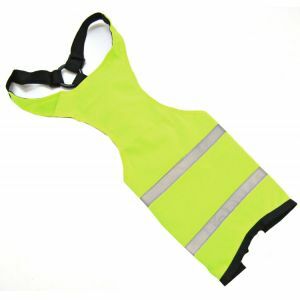 If you have a breed of dog that has a smooth short coat such as a Jack Russell or Pointer or one that has been clipped short, the addition of a sweatshirt type vest will stop them feeling a chill. Comfortable fitting apparel will make the task of getting your dog to accept wearing something over his natural coat. Placing the garment on and taking it off is something both dog and owner will have to master with practice. Using verbal praise as a reward when you are putting the garment on will help the dog to accept what you are doing, remember it will feel strange to him at first. Start by leaving the item on for a short period if he protests try distracting him with his favorite toy or treat that usually works. Leaving the garment on longer each time you want him to wear it and rewarding your pet. The best time to train your dog is when they are puppies, although for those of us who have had our pets for many years having a little more patience and perseverance will be required. 1. Measure your pet from the base of the neck to the base of the tail. This measurement is the length needed to determine what size clothing your pet will need. NOTE: loose clothing is more comfortable for your pet and looks better than tight clothing. If in doubt, order the next size larger. Also, please keep in mind that certain breeds e.g. greyhound, dachshund or an over or underweight dog may need a custom fit. Protecting dogs' paws from the elements, dog boots take some beating, giving protection to their pads from snow, ice, hot sand, rocky ground, broken glass and all kinds of debris. That is if your dog will keep them on! Of all dog apparel dog boots are probably the most difficult of all for your dog to become accustomed to. My advice here is to buy some inexpensive ones first and keep trying with those if your dog takes to them, without developing some exaggerated hilarious clown walk, then you can up grade. When out walking with your dog this winter his health and safety are your responsibility. Give your dog the same consideration as you would give a child when walking out in winter, a warm weatherproof coat, reflective collar and/or reflective dog leash, so that he is warm, safe and can be seen by other road users. 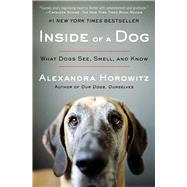 The bestselling book that asks what dogs know and how they think, now in paperback.The answers will surprise and delight you as Alexandra Horowitz, a cognitive scientist, explains how dogs perceive their daily worlds, each other, and that other quirky animal, the human. 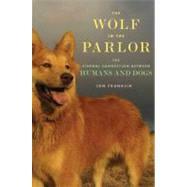 A man and puppy exhumed from a 12,000-year-old grave sends a two-time Pulitzer Prize-winning science writer on a journey to understand the human/canine relationship.